Great question mate. Let’s give you a FUN solution, from the Feel It Real Power Pack. When you are first learning how to Feel It Real, it’s often a challenge at first when you are still working a job – to FEEL as if you are financially free and doing EXACTLY what you want. The main tool we suggest you begin with is the I REMEMBER WHEN METHOD. Here are two ways you can use the method starting right now – to create the state you want in life. We’ve done them both, and they both work wonderfully. …or at the end of the day – you can REMEMBER WHEN you worked at a job – from the perspective you no longer work there. It’s like looking back at the day at work – from a chosen point in time AFTER you have become financially free. HINT: To me, this feels like “looking back” or “remembering” when I was in high school, or when I bought my first motorbike…. …is to use I REMEMBER WHEN in this kind of situation is to remember when – you realized you were financially free. Remember when you paid off your mortgages. Remember when you hired your first professional accountant and financial planner – because taking care of your surplus of funds wasn’t something you wanted to do personally. Many blessings Marcus, and thank you for being a supporter of the Neville Goddard Project. 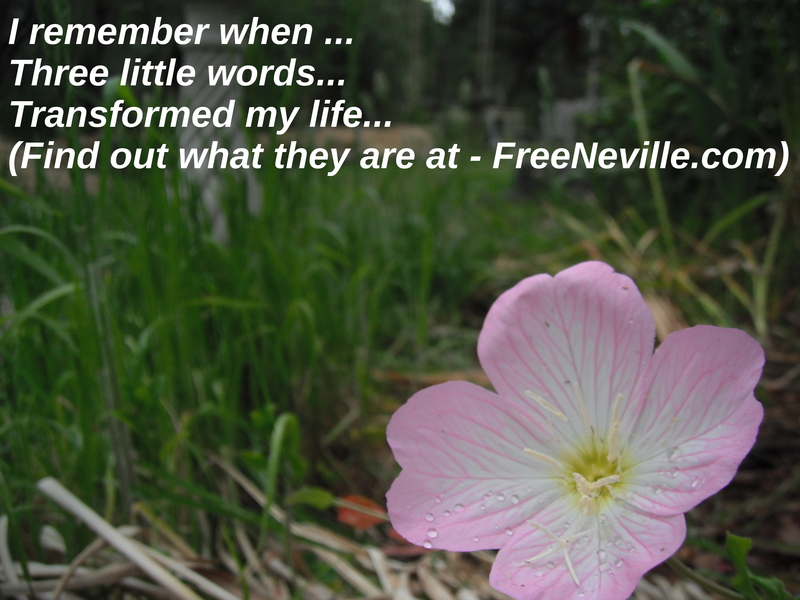 19 Comments on "How To Feel Financial Freedom When You Can’t Because – Free Neville Goddard"
Another great gem of advice. Good one TT! I have one problem with this- when I do Remember when I used to work at a job puts me in a place of worry- where I ask myself, what happened? Was I fired, laid off? Is there a different way to phrase the I remember when statement putting the current job in the past? Thanks TT but I think you linked me back to this article “How To Feel Financial Freedom When – Free Neville Goddard” Did you mean to point me to a different one? You’ll find the second method in the article is EXACTLY what you are looking for. “remember when – you realized you were financially free” – brilliant. This exercise, this tool – is always a little tricky for me. I believe it is because of the wording. It has proven to be difficult for me to use effectively, yet everytime I read a lesson on it… it seems so easy. Do you have any ideas as to how I can flow with it easier? I don’t know why this one is a little hard for me. Both ways are effective LMARIE but…. It’s not the words that matter, it’s the FEELING of remembering when….. When you did find it…..
It’s like experiencing the present moment – of looking for a home – from the future – after you have found it. Another great one!! Thanks, TT! A year later.. and you know I now really get this! I am wanting to just report the flow of the success of using these tools, here in your forum. I think lots of us of course get better and more better at using and FEELING the results of each of these tools..and as out lives get better and more better because of it… I want to be a voice that (publicly) celebrates that. Thanks so much for the clear, concise lessons you share with us to keep us directly and specifically on track with Neville. There quite simply is no better thing. Such ace explanations and examples. Finally managed to get a handle on the first, but will now combine it with second. Brilliant! Thanks TT. I was living in a pretty run down ‘bedsit’. I kept doing my feel it real sessions in which I was living in a house I have seen and love. I couldn’t quite get the right feeling though. Something would come up like “yeah right like you could ever live there” or fear of the cost of running such a nice house and other doubts. 2 weeks ago I was sat after my feel it real session looking at a new patch of mould on the wall and I knew I hadn’t nailed my session because I felt really down. I decided instead to start using I remember when. So I looked at the mouldy wall and thought ‘I remember when I lived in the little bedsit with mouldy walls’. I felt immediately better. Each time I felt down I stopped my thoughts in their track and simply said/thought and felt I remember when… four days after my first I remember when, a lady totally out of the blue asked me if by any chance I was looking for somewhere to live. To cut a long story short I have moved into a beautiful house that costs less than the mouldy wall bedsit. I actually am remembering when I lived in the old place now. Funny thing too, during my I remember when moments I also would add I remember when I didn’t have a garden, the new house has a garden and I had added I remember when I had to share a bathroom, I have my own en suite bathroom in the new place. It’s so amazing, I’m so happy and it all happened so naturally and effortlessly and within 4 days. I had at one point begun to worry about how long this change might take and the circumstances by which it would happen. To stop the worry I made a point of feeling I remember when in a relaxed and happy way to suggest that the change from old mouldy place to new place had been a breeze, and it really was a breeze. That’s awesome Emma, very inspiring! Good on you for diving in and diving deeper! This article really helped me. I was having challenges to feel it real and was blocked somehow. I can feel it now that I remember when and create the event desired.